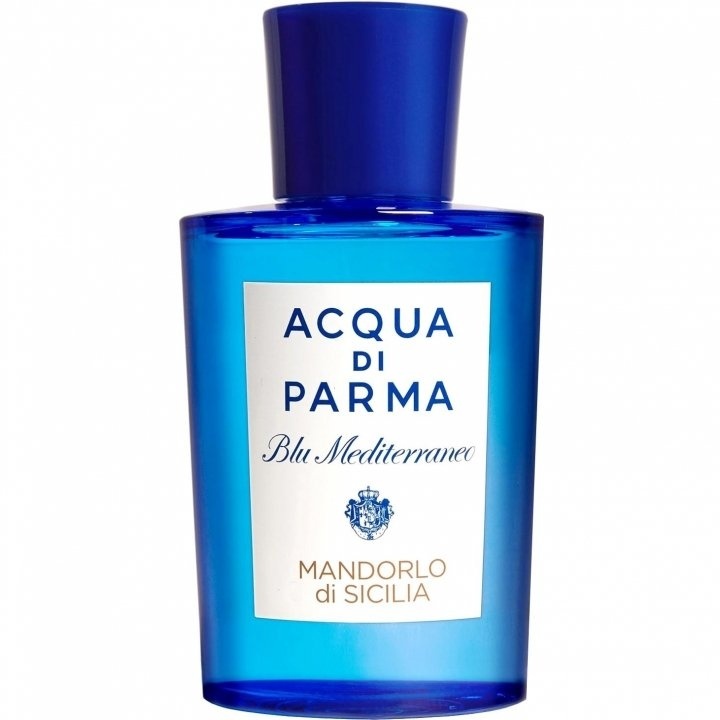 Blu Mediterraneo - Mandorlo di Sicilia is a perfume by Acqua di Parma for women and men and was released in 1999. The scent is sweet-gourmand. It is being marketed by LVMH. 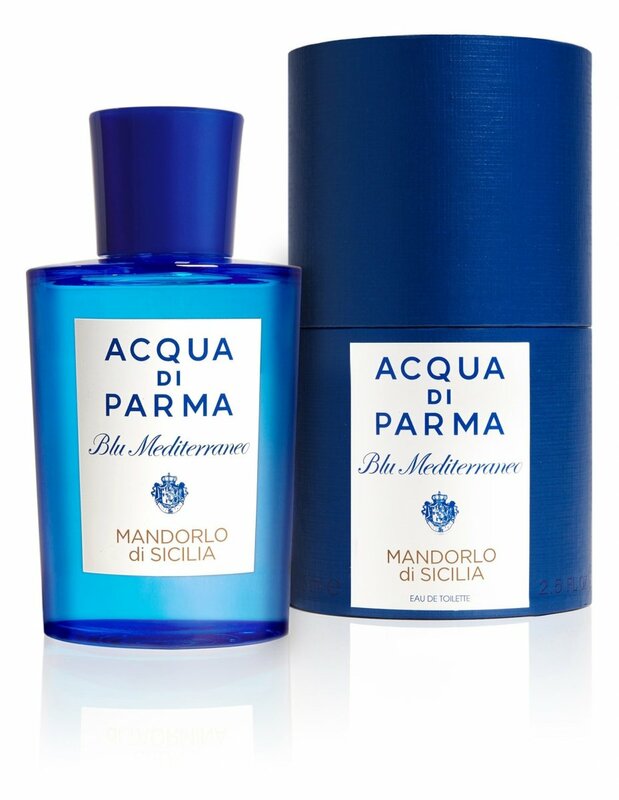 Acqua di Parma - a very interesting brand, which is mainly known for the timeless classic Colonia. 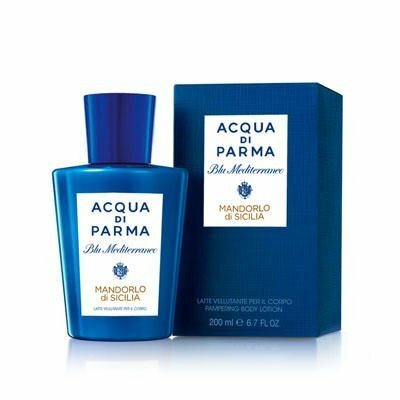 A brand I've wanted to test for a long time and now I've finally added three fragrances: Colonia, Fico di Amalfi and this one. I was curious about these 3, some will surely follow. Very affordable and rather inexpensive. This one gets already for approx.100Euro a 150ml. Fair! The Blu Mediterraneo line has many interesting concepts. This pyramid appealed to me the most. Translated Sicilian Almond Tree it already starts interesting in name and concept. Almond Anise Vanilla, I was curious. The bottles at AdP are all very noble. Especially the Blu series is an eye-catcher with a nice blue tone. Even the simple labels with beautiful writing look very noble. Great. Its fragrance is very sweet right from the start. The star of this composition is clearly the almond as the name implies. This almond is accompanied by a modern bubblegum-like sweetness. I like it a lot. Also the anise note is well perceptible. Almond and anise are accompanied by a subtle fruity note and ylang ylang. Well done, especially if you get a lot of sweetness. Here you get a lot of gourmand sweetness without being too heavy. Balanced and well wearable on warmer days. The base becomes much softer with vanilla and soft woody notes plus the almond note which remains throughout. Not a fragrance everyone likes. Should definitely be tested and not bought blind. He polarizes and will also find some opponents. This is often the case with very sweet fragrances. Also unisex only conditionally. As a man you should be able to give off very sweet scents. With a conservative attitude, this fragrance is more likely to be classified as a women's fragrance. I also find the scent wearable as a gentleman when you're the type for sweetness. Should definitely fit the type. The evaluation of the performance often amazes me here. Some that I feel are weak are overrated here and some really good ones like this are clearly underrated here. For me this one has a really good Sillage including very good durability. Shelf life should be between 7 and 8 hours. The Sillage is also very good. Especially at the start very strong and also hours afterwards very long in the nose. Accompanies the wearer well. A sprayer on the hand and it comes for a long time something in the nose, without leading the hand to the nose. Top. Especially for the evening a successful fragrance. A true all-rounder when it comes to the season. Only to the great heat possibly too heavy. For a sweet Gourmandigen fragrance exceptionally good to wear even at temperatures above 20 degrees. A fragrance I can recommend for all who like sweet scents. Very good to wear, especially for younger people, as it is very modern even if it has been on the market since 1999. A sweet yet delicate gourmand. Almond and vanilla notes are predominant here. I don't agree with the "bubblegum" vibe but I can see what people mean. It does smell of coffee and sugar a little to me but very much in a delicate way. I find it a very pleasant fragrance and those who like this kind of gourmand will enjoy it very much. Mandorlo di Sicilia opens with a sweet almond, orange and creamy vanilla combination that resembles one of the worst smelling (and tasting) cream-orange liquid medications I had to take as a kid for cough and congestion called "Tussagesic." This root beer and Creamsicle monstrous hybrid opening calms down as the orange and creamy vanilla recede, allowing the almond to shine more brightly coupling with a now less creamy vanilla, mild anise and musk from the base that presents itself as support. Projection and longevity are both average. This is the most unique of the four Blu series scents I have sampled over the past week, and it also is easily the worst of them. Tussagesic's terrible taste and smell left an indelible mark on my childhood memories in the most negative of possible ways, and this scent has brought them all back. No one should have to pay to smell this kind of stuff, in my opinion. To be fair, Mandorlo di Sicilia does improve once you get past the open and early heart notes, but even this improvement is only to the point of the scent now being just "bad" instead of "absolutely terrible." I think I have had my fill of the Blu line and it would take a near-stratospherically innovative and interesting release to get me to return for more. I strongly recommend steering clear of this 1.5 to 2 star out of 5 stinker in particular. I must say that this was a delightful surprise. I did not expect this fragrance to be so sweet and feminine. 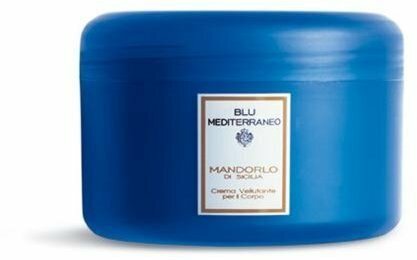 Blu Mediterraneo Mandorlo di Sicilia has barely any citrus in it at all, which makes it so different to the other fragrances in this series. Bergamot is the only citric note present and that in itself has been smothered in icing sugar. The top notes are absolutely beautiful, smelling almost like roasted marshmallows. The frangipani, almond and liquoricey anise establish this fragrance as a gourmand from the very moment it touches the skin. The introduction of the coffee note in the heart, while it does create an interesting warmth, remains light and Summery in a way that is very likable. Remaining sweet and fluffy all the way through, Mandorlo di Sicilia is exquisitely strange, finishing with a sugary soapiness in the drydown. The sweetness will honestly not appeal to everyone, particularly the citrus lovers who expected yet another citrusy winner from this series. I prefer the change and I like that its sweetness is light and weather appropriate. I give this fragrance a huge round of an applause for managing to shock me, because it doesn't happen very often. I'd love for it to be Summer already so I can enjoy this fragrance to the extreme. The sillage and lasting strength is very good, unlike Arancia di Capri and Fico di Amalfi whose fragrance diminished on my skin in as little as a few hours. For those that love sugary gourmands and want something a little less cloying for Summer, please give Mandorlo di Sicilia the best chance possible.